How one alum uses orchestra as an educational space to address inequities and bring inclusion to the concert hall. It is also natural that the orchestra founded in his name would be dedicated to addressing issues of social exclusion in the arts and elevating the voices of marginalized composers. As a student in the Arts in Education (AIE) Program, Cueva found herself having the same conversation with cohort members and with other graduate students from departments across Harvard: How do you expand the scope of classical music, and how do you invite in audiences and musicians traditionally excluded from the concert hall? Along with co-founder Kai Johannes Polzhofer, a Ph.D. student in the music department, Cueva welcomed musicians from across the Harvard community and the greater Boston-area, including members from Longy School of Music and the New England Conservatory, to join the orchestra. 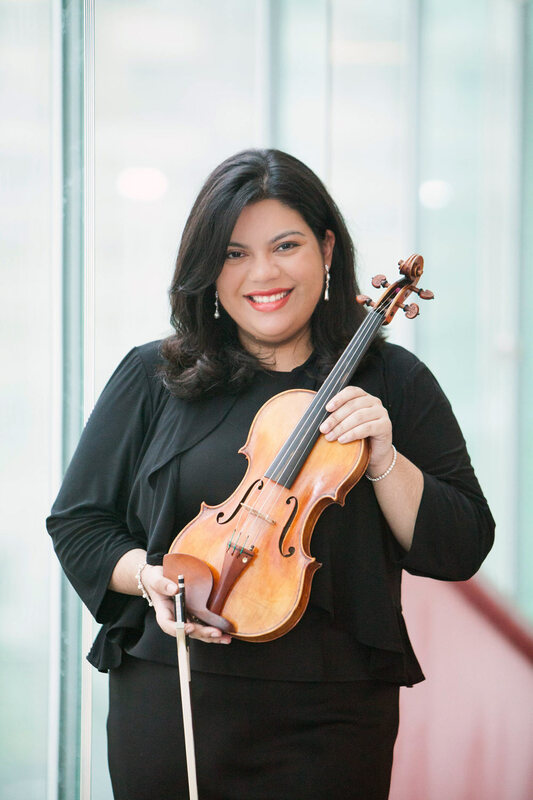 Before coming to HGSE, Cueva, a Juilliard-trained violinist, had taught music throughout New York City, working in Juilliard’s office of education outreach as well as the Opportunity Music Project, a nonprofit that provides free music lessons for students. “My students were really the reason I applied to HGSE, to become a better teacher, to not only rely solely on the way I had been taught, but to find ways to connect with them and make music engaging,” Cueva says. 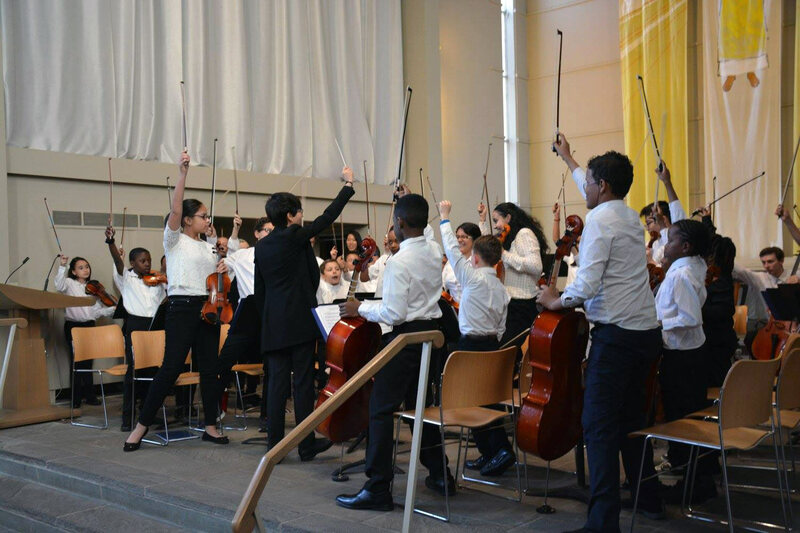 Through the Du Bois Orchestra, Cueva brought 60 students from the Opportunity Music Project along with their parents to HGSE for a concert and symposium in April 2016 (photo, right). In addition to a performance, the orchestra toured students around campus and hosted a bilingual panel discussion for parents around the challenges of getting into institutions like Harvard. In 2017, the group expanded their programming, bringing back students for a discussion around the role art can play in social issues. This year, the Du Bois Orchestra is launching a community impact project to work with youth involved in the juvenile justice system. Cueva says this next step is an expansion of the original goal of the orchestra that she is excited to tackle. “We are passionate about opening up the idea of the concert hall and who can come in to experience live performance, but also going to places where live performance isn’t always accessible. We’re so excited to create alongside these students and learn from them,” she says. Funding for this new project came in part from an arts leadership grant Cueva received last May through From the Top, a radio program that serves as a platform for young classically-trained musicians. The money will help the orchestra welcome teaching artists to work with the youth involved in the juvenile justice system. The grant comes full circle for Cueva, who won a scholarship through From the Top and the Jack Kent Cooke Foundation when she was 17. Now, Cueva has taken her passion for sharing music with students to another level by supporting educators across the country as the manager of Learning and Engagement Programs for the Weill Music Institute at Carnegie Hall. But she says she never forgets her students.